September 30th is designated as International Blasphemy Rights Day. This is when we bring awareness to efforts to censor dissent using the false cover of “protecting religious beliefs”. Although very rare in the US, jail time and even death comes to people deemed to have committed Blasphemy. In the US, public bullying sometimes results in “voluntary” self-censorship. 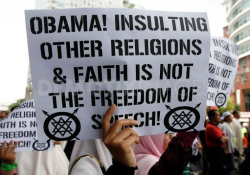 Blasphemy laws are bad for freedom. A vibrant society needs and allows dissent in all forms so that the people are able to make informed choices in their lives. And how tolerant we are of dissent says a lot about how we view our country and our freedoms. This entry was posted in Essays, Humanist Living, Issues and tagged 1st amendment, American Humanist Association, blasphemy, bullying, censorship, Center of Inquiry, civil liberties, civil rights, dissent, freedom of expression, freedom of religion, freedom of speech, freethought, International Blasphemy Rights Day, religious bigotry, religious discrimination, religious dissent, religious freedom, self-censorship on September 30, 2012 by Doug. What Does Religious Freedom Day Really Mean? 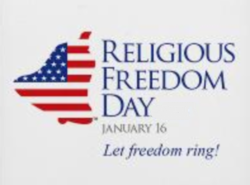 January 16th is National Religious Freedom Day. The day commemorates the Virginia General Assembly’s adoption of Thomas Jefferson’s landmark Virginia Statute for Religious Freedom on January 16, 1786. The Virginia Statute was the basis of the 1st Amendment of the US Constitution and also can be used to support Jefferson’s idea of the separation of church and state. The Religious Right have of course co-opted the day by mass marketing misleading information about what real religious freedom means in this country. Luckily, Americans United for Separation of Church and State (AU) has some help available to tell the truth. This entry was posted in Essays, Issues and tagged 1st amendment, bill of rights, church and state, National Religious Freedom Day, religious bigotry, religious discrimination, religious freedom, Thomas Jefferson, US Constitution, Virginia Statute for Religious Freedom on January 10, 2012 by Doug.